You have added Wavelengths Chevron Contrast Dress in Mint into shopping cart. FINAL SALE. From the bold, contrasting color scheme to the flattering piped princess seams—this dress is definitely a winner! The Wavelengths Chevron Contrast Dress is fully lined and made of chiffon. 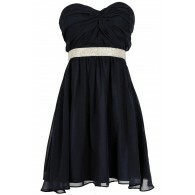 It has a solid strapless neckline with contrast black piping at the neckline, princess seams, and empire waist. The attached skirt has a A-line cut and a bold chevron print throughout. A fabric cutout and fabric covered buttons at the back complete this dress. The Wavelengths Chevron Contrast Dress would look cute paired with black pumps or heels and a purse. You could also try dressing it down with flats or sandals. 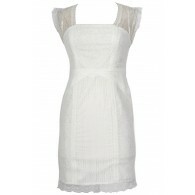 Toss a fitted cardigan or jacket over this dress on chilly evenings when you need more coverage. Also available in Ivory. Details: Fully lined. Hidden side zipper. 60% cotton, 40% polyester. Lining: 100% polyester. Hand wash cold water separately. Color will bleed. No bleach. Hang to dry. Small measurements: Length from top of bust to hemline: 29”. Bust: 32”. You have added Wavelengths Chevron Contrast Dress in Mint into Wishlist. You have added Wavelengths Chevron Contrast Dress in Mint for Stock Notification. You have set Wavelengths Chevron Contrast Dress in Mint as a loved product. You have removed Wavelengths Chevron Contrast Dress in Mint as a loved product.